Yesterday, I introduced you to my Spicy and Savory Tomato Mango Jam. Today it's about a fun way to use that jam... on Pizza! My son was the inspiration behind this pizza since he surprised me on how much he loved the jam. 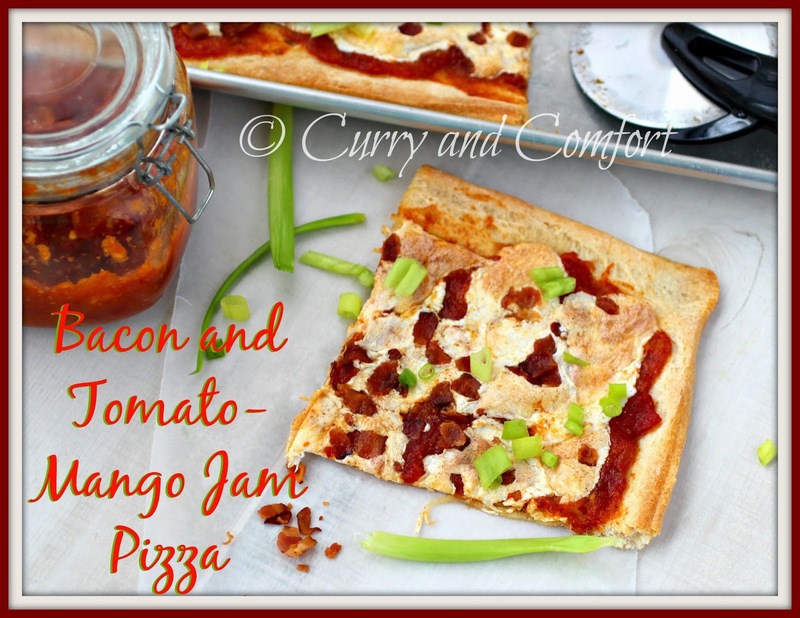 He loves pizza and bacon so this was a very easy recipe to pull together. I used an Afghan Bread as the crust, but you can use any baked pizza crust or Naan for the crust as well. I applied a light layer on the jam as my sauce and added a lot of mozzarella cheese and baked it to melted perfect. 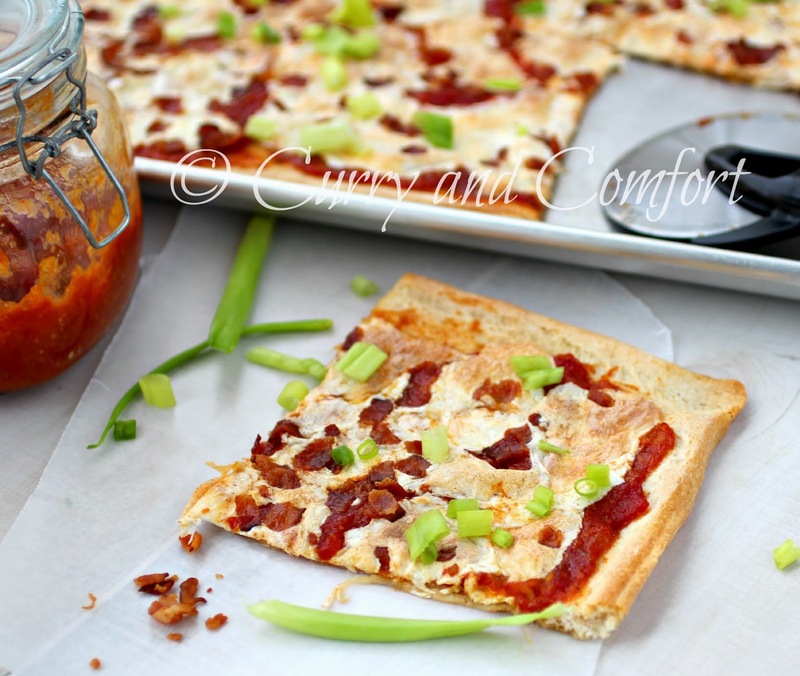 The final touches were lots of crispy bacon and scallions to send this pizza over the top. My son loved it and so did the rest of the family. Score one for Mom and her Tomato Mango Jam. 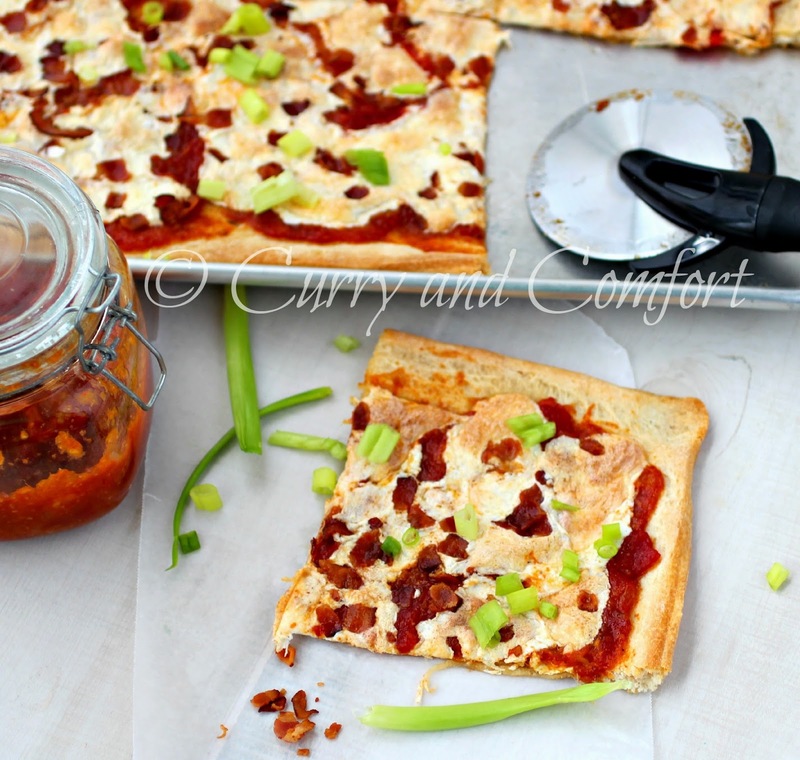 Place a thin layer of the tomato jam on pizza (as the sauce). Place shredded cheese and bake in a 400 degree oven until crust is crispy and cheese is melted. Then top with crumbled crispy bacon and sliced scallions. Slice and serve. Enjoy. Prepare all ingredients to cook. Place all ingredients in pan on medium heat and cook (stirring occasionally) for about 30 until liquid is cooked out and a jam like consistency forms. Adjust seasoning as needed. Allow to cool then place in a clean glass airtight jar and place in fridge for up to one month. Enjoy. How interesting! What a fun way to use the jam and impress the kids. I would be impressed too. I so want to try your tomato jam! I've never had a savory jam! This pizza looks so simple and tasty! Jam on pizza? Oh yea...I could eat that, especially topped with bacon. I put jam on biscuits and gravy, so pizza looks like a great idea!